At least two people have been killed and numerous other hurt in a multi-vehicle crash near the small town of Weimar, Texas. The crash happened Wednesday June 3rd, 2015 around 12:40 in the afternoon on Interstate 10. Weimar is approximately 75 miles west of Houston. 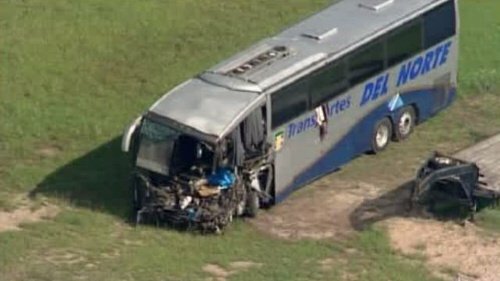 Texas Department of Public Safety (DPS) officials said the commercial bus operated by a company called Turimex crashed into the back of an 18-wheeler, causing that 18-wheeler to rear-end another 18-wheeler in front of it. Houstonian Susan James was interviewed by Channel 2 News Houston about her involvement in the wreck as she drove home from Hallettsville. 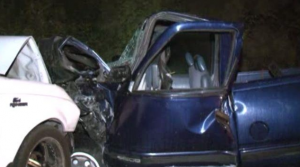 Ms. James was fortunate to be able to walk away from her wrecked Cadillac SUV. The two deceased people were both on the Turimex bus. One was the bus driver, 31-year old Miguel Angel Tobalina-Gonzalez, the other was 34-year old Roman Juan Domicillio, a passenger. According to DPS, the bus was transporting migrant tobacco workers from Laredo to North Carolina. Turimex, the bus operator, is based in Laredo, Texas but has several Houston locations. According to current information posted to The U.S. Department of Transportation Federal Motor Carrier Safety Administration web site, Turimex, LLC operating under US DOT # 650034, carries $5,000,000 of liability insurance under an insurance policy issued by Commercial Alliance Insurance Company.